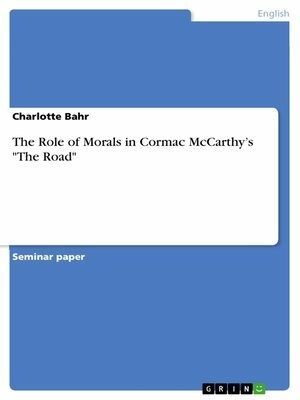 The Role of Morals in Cormac McCarthy's "The Road"
Seminar paper from the year 2011 in the subject English Language and Literature Studies - Literature, grade: 1,3, University of Würzburg, language: English, abstract: The Road, Cormac McCarthy's tenth and Pulitzer Prize winning novel, tells the story of an unnamed man and his son, trying to survive in the aftermath of a nuclear catastrophe that left Earth stuck in atomic winter, where nearly all animals and plants are extinct, ashes are falling from the sky and the ground is burned and barren. Following the road throughout the country their goal is to reach the coast in hope for a better future. On their way they constantly struggle with starvation, sickness and the threat of thieves and cannibals that roam the road. Except for some clothes and the food they find in abandoned houses and supermarkets, they have nothing but each other to hold on to. The novel follows these two characters on their journey through a post-apocalyptic America, seeing how the catastrophe ripped apart civilization and turned most of the people that are still alive into cannibalistic savages that do anything to survive and have practically abandoned any kind of moral. In contrast to that, the man and his son still follow a moral code, albeit the father doesn't follow it as strictly as the son does. But in an environment like this, where people do whatever it takes to ensure their survival, having morals and values gets the man and his son in several dangerous situations, yet they stick to their believes and insist that they are the "good guys" in a world full of "bad guys". In this seminar paper I will discuss the role of morals in the novel, especially in the lives of the man, his son and the savages they encounter on their way. Where does the faith in these morals come from? In what situations does the father abandon this code and why? I will also consider the advantages and disadvantages that morals and values have for the two and why they still insist, even after witnessing some extremely brutal situations, to continue "carrying the fire" through a world where the human race is on the verge of extinction and even God seems to not care anymore. Is there any hope left for a world where morals could mean something again or do the man and his son ultimately fight for a lost cause?